Four mothers who lost husbands, brothers and sons in the Srebrenica genocide have told their stories to a group of high-profile delegates from Scotland – giving them a glimpse into the horror of the atrocity in its 20th anniversary year. The visitors were taking part in a Lessons from Srebrenica visit and listened as the women recounted their experiences of the massacre, which saw more than 8,000 men and boys – mostly Muslims – murdered by Bosnian Serbs in July 1995. The four Mothers of Srebrenica, Hajra Ćatić, Hatidža Mehmedović, Munira Subašić and Suhra Sinanović, met the Scottish delegates upon their arrival in Bosnia-Herzegovina. Upwards of 10,000 men and boys set out on a desperate and perilous 63-mile trek across hills and forests to reach the nearest Muslim territory at Tuzla. Only 3,000 survived. Hatidža Mehmedović lost two sons and her husband. “The Serbs kept fathers and sons together waiting to be killed. Many of us will never see the joy and happiness of family because evil people removed joy from our hearts. I would not wish this life on anyone. Suhra Sinanović lost 23 members of her family – including her husband – and the mother-of-two was left alone with her son and daughter, now training to be a doctor and an engineer. Munira Subašić lost 22 members of her family. Organised by Remembering Srebrenica, the visit was led by The Very Rev. Dr. Lorna Hood, former Moderator of the General Assembly of the Church of Scotland. 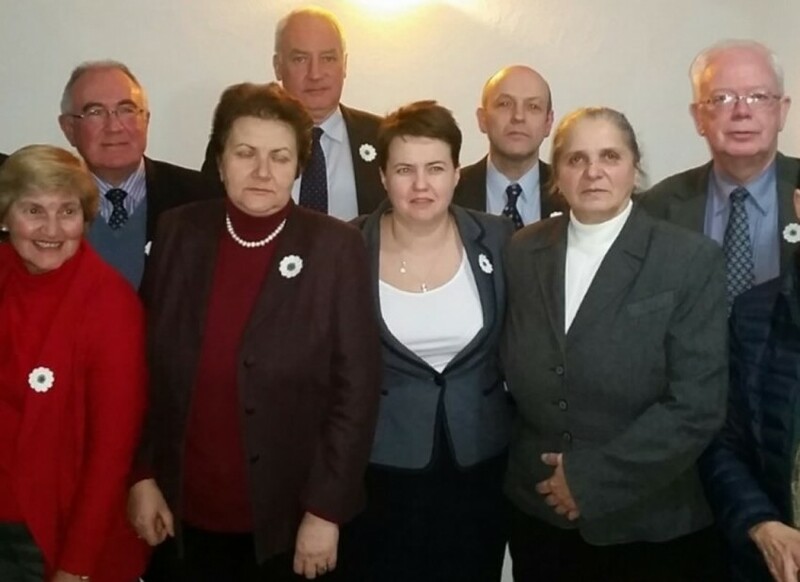 The group included Ruth Davidson MSP, Leader of the Scottish Conservatives and The Rt Hon. the Lord Wallace of Tankerness QC Jim Wallace, HM Advocate General for Scotland and Deputy Leader of the House of Lords. Delegates visited the Srebrenica-Potočari Memorial Complex, where many victims of the 1995 genocide are buried, as well as visiting the International Commission on Missing Persons (ICMP) in Sarajevo and Tuzla. “The courage and determination of the mothers is what hits you,” said Ruth Davidson. “They aren’t bitter, they don’t want revenge. They just want people to know what happened here. “The barbarity is shocking; seeming inhuman and it is told so matter-of-factly. The memorial is staffed by survivors of the ‘death march’ and the families who perished. Srebrenica’s story is their story too; it is the story of their friends, their brother, their husband, their son. Lord Wallace said that the visit had been profoundly moving – particularly listening to the Mothers and visiting the ICMP, whose staff’s dedication, determination and skill showed it was possible for good deeds and compassion to come out of evil. “No matter how much you read about Srebrenica and the events of July 1995, hearing the Mothers’ testimony at first hand brings home the reality and scale of the evil perpetrated here,” he said. “It was not only the agony of these days, but the years of waiting for their loved ones to be identified. For Lorna Hood, it was her second visit to Srebrenica to meet the Mothers’ and no less moving for her than the experience last year. “Our meeting with the Mothers was just as poignant and painful as it was before,” she said. “You cannot help be inspired by their courage and tenacity but also humbled by their lack of malice or desire for revenge. “Genocide seems unthinkable between those who had been neighbours. However, the fact that it happened there is a sober reminder that it can happen anywhere, unless we learn to respect and appreciate our differences along with our common humanity whether we are of one faith or no faith.